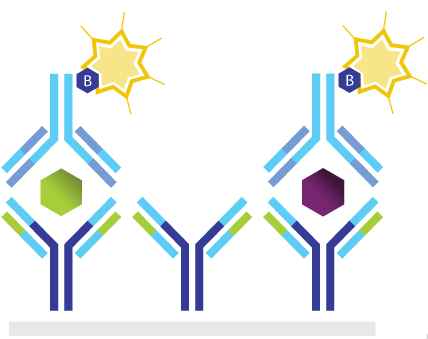 The RayBio® Membrane-Based Antibody Arrays (C-Series) are tools for screening and comparing expression levels of many cytokines, growth factors, proteases, soluble receptors, and other proteins in a wide variety of sample types. The C-Series Arrays utilize the sandwich immunoassay principle, wherein a panel of capture antibodies is printed on a nitrocellulose membrane solid support (usualy 2.5 cm x 3 cm). The array membranes are processed similarly to a Western blot (chemiluminescent readout). RayBio® C-Series Human Obesity Antibody Array 1 Kit. Detects 62 Human Adipokines. Suitable for all liquid sample types. RayBio® C-Series Human Acute Kidney Injury Antibody Array 1 Kit. Detects 20 Human Cytokines. Suitable for all liquid sample types. RayBio® C-Series Human Angiogenesis Antibody Array 1 Kit. Detects 20 Human Angiogenic Factors. Suitable for all liquid sample types. RayBio® C-Series Human Angiogenesis Antibody Array 2 Kit. Detects 23 Human Angiogenic Factors. Suitable for all liquid sample types. RayBio® C-Series Human Apoptosis Antibody Array 1 Kit. Detects 43 Human Apoptotic Factors. Suitable for all liquid sample types but intended for use with cell and tissue lysates. RayBio® C-Series Human Atherosclerosis Antibody Array 1 Kit. Detects 20 Human Atherosclerotic Factors. Suitable for all liquid sample types. RayBio® C-Series Human Chemokine Antibody Array 1 Kit. Detects 38 Human Chemokines. Suitable for all liquid sample types. RayBio® C-Series Human Cytokine Antibody Array 1000 Kit. A combination of Human Cytokine Antibody Array C6 & C7. Detects 120 Human Cytokines. Suitable for all liquid sample types. RayBio® C-Series Human Cytokine Antibody Array 10 Kit. Detects 49 Human Cytokines. Suitable for all liquid sample types.